Web Desk: Mahira Khan shut up a troll who commented about her photos with Ranbir Kapoor that had gone viral in September last year. It was rumoured that they were dating after a video from Global Teacher Prize event of them having what looked like a lover’s tiff did the rounds of social media. 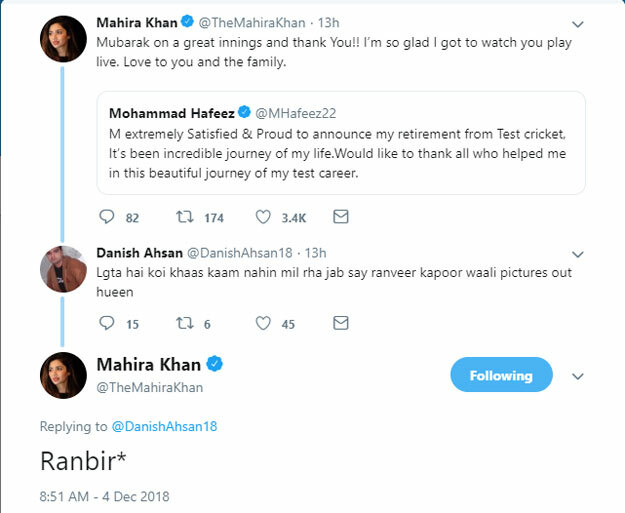 A social media user tried to troll Mahira by replying to her tweet to Mohammad Hafeez by posting, “Lgta hai koi khaas kaam nahin mil rha jab say ranveer kapoor waali pictures out hueen.” Mahira had a savage reply and posted, “Ranbir*”. Mahira had opened up about the leaked photos and had said in an interview that she is a very careful person otherwise and it is her personal life. People are praising her for her epic reply to the user. Love it Mahira…just love your spirit!